Well, yesterday’s very small landscape wasn’t, after all, the “last” picture I’ve done for the Fall Studio Tour. I came across this picture (which I began last Summer) last night. Today?…. I patiently/irritatedly set out the pastels, pencils, and brushes...KNOWING full-well that I was going to have to spend at least two hours “on-hold” while I waited to speak to actual humans from Wells Fargo, American Express, Home Depot, Duke Medical,and Century Link telephone repair-service. All were very long waits……so I just drew and painted while I cradled the telephone between my ear and my shoulder. It just occurred to me that this is the only picture I’ve ever done to the accompaniment of Muzak. (French, need I emphasize?) mother (“Un homme qui n’est plus capable de s’emerveiller a pratiquement cesse de vivre”). I went a-googling and found (as far as I can tell) that the original German quotation is about fifteen times the length of the English or French translations. 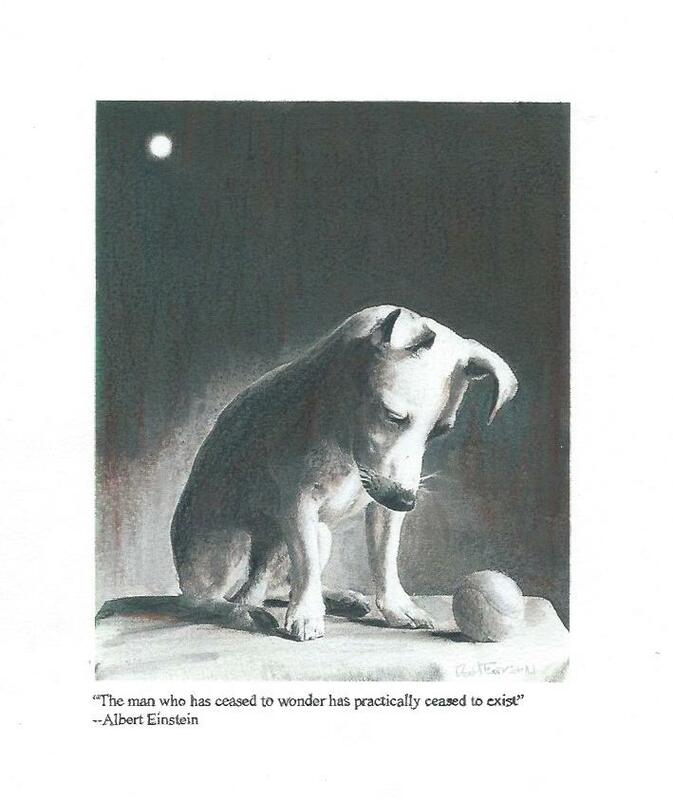 Why does that not come as a surprise to me?…..
That said?…..the relievedly-brief English translation (and the key to this puzzle-picture) is “The man who has ceased to wonder has practically ceased to exist”.